Marco Rubio has been slow to pick up the pace in Iowa, but his campaign aides say he’s “making a full commitment” to the state that leads off voting in the presidential race. “We’ve doubled the number of staff in the state in recent weeks, and plan to increase the amount of time Marco spends in the state,” Alex Conant, a spokesman for the GOP presidential candidate, told The Des Moines Register. Aides for Rubio, a Florida U.S. senator, say they’ve been biding their time, knowing that victory in the caucuses traditionally goes to the candidate who gets hot at the end. Rubio enjoys a high favorability rating in Iowa even if his ballot share has been low, noted Jack Whitver, his volunteer state chairman. Rubio was one of the last candidates in the 2016 race to hire a paid Iowa director, but he has now tapped Arkansas Republican Clint Reed for the job. “We were just trying to find the right person,” Whitver said. Rubio still has only a handful of paid Iowa staffers, and he didn’t open an Iowa headquarters, in Ankeny, until Aug. 28. And when he has campaigned here, he hasn’t often strayed from central Iowa. It’s a very different strategy from the one employed by Wisconsin Gov. Scott Walker, who opened an Iowa office and hired an Iowa adviser at the beginning of the year and has vowed to campaign in all 99 counties. Walker was the Iowa front-runner for the first six months of 2015, rising to a high of 17 percent in the Register’s late May Iowa Poll. New York businessman Donald Trump knocked him from that perch, capturing 23 percent of the support among likely caucusgoers in the late August Iowa Poll. Meanwhile, Rubio has lagged in the bottom tier, never capturing more than 6 percent support. But 67 percent of likely GOP caucusgoers have positive feelings about Rubio. Only two other Republican candidates are viewed favorably by more caucusgoers: retired doctor Ben Carson (79 percent) and Walker (71 percent). Former tech company CEO Carly Fiorina is fourth at 64 percent, the August poll found. Complimentary press reviews about his demeanor and his foreign policy answers in the second GOP debate, held Wednesday night in California, could help lift Rubio’s standing in the horse race in Iowa, Whitver said. Another big boost could come in November, when the campaign plans to begin advertising in Iowa. Some Iowa Republicans say they like what they’ve heard about Rubio, but decided to throw their early support behind someone who they’ve had more interactions with. 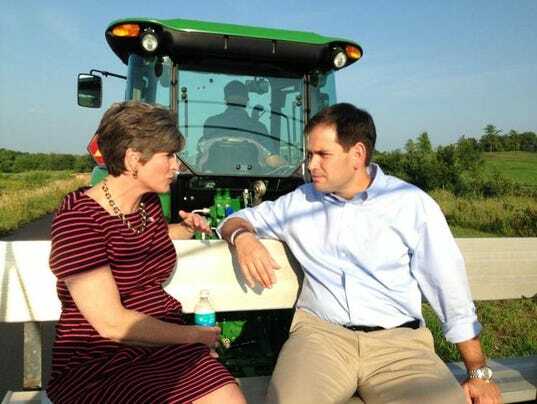 Rubio has spent 17 days in Iowa during the 2016 campaign cycle; 11 other Republican hopefuls have spent more time here. While other candidates have fanned out across Iowa, Rubio’s tour route has hugged the Des Moines metro area. The only times he has ventured over to western Iowa or eastern Iowa were during two campaign tours in July. He added dots in scattered counties to his campaign map when he accompanied Iowa Republican U.S. Sen. Joni Ernst to several functions she organized. But more than half of Rubio’s campaign events have been staged in Polk, Dallas and Story counties, a Register visit tracker shows. Rubio’s absence from western Iowa may have served as a cooling-off period for deeply conservative Republicans there, some of whom were highly critical of him for his 2013 immigration reform bill, which offered immigrants in the country illegally a path to citizenship. And as a first-term senator, Rubio has had to fight off comparisons to Democratic President Barack Obama. Poll respondent Barbara Hirsch, a retired teacher and county attorney’s office victim advocate, named Rubio her No. 1 pick in May. “I think after watching the last debate, I probably, if I had to vote today, would vote for Rubio, but I sure like Carly a lot,” Hirsch, who lives in Dubuque, said Friday. Rubio remains fully committed to the other early states, but will be returning to Iowa soon, his aides said. “(He’s) making a full commitment to Iowa,” Conant said. Clint Reed, 38, who’s been tapped by Marco Rubio as his paid Iowa campaign director, has experience with political campaigns in Southern states. He’s a partner at Impact Management Group, a public affairs firm with offices in Little Rock, Ark., and Baton Rouge, La. He’s a former southeast regional political director for the Republican National Committee and former executive director of the Republican Party of Arkansas. Reed managed the Bush-Cheney campaign’s re-election efforts in Arkansas in 2003-04.